The U.S. Government Accountability Office (GAO), "the investigative arm of Congress"has released a report, Intellectual Property: Observations on Efforts to Quantify the Economic Effects of Counterfeit and Pirated Goods, saying we don't have decent empirical evidence to quantify the effect of counterfeiting and piracy. "According to experts and literature GAO reviewed, counterfeiting and piracy have produced a wide range of effects on consumers, industry, government, and the economy as a whole, depending on the type of infringements involved and other factors. Consumers are particularly likely to experience negative effects when they purchase counterfeit products they believe are genuine, such as pharmaceuticals. Negative effects on U.S. industry may include lost sales, lost brand value, and reduced incentives to innovate; however, industry effects vary widely among sectors and companies. The U.S. government may lose tax revenue, incur IP enforcement expenses, and face risks of counterfeits entering supply chains with national security or civilian safety implications. The U.S. economy as a whole may grow more slowly because of reduced innovation and loss of trade revenue. Some experts and literature also identified some potential positive effects of counterfeiting and piracy. Some consumers may knowingly purchase counterfeits that are less expensive than the genuine goods and experience positive effects (consumer surplus), although the longer-term impact is unclear due to reduced incentives for research and development, among other factors. While experts and literature we reviewed provided different examples of effects on the U.S. economy, most observed that despite significant efforts, it is difficult, if not impossible, to quantify the net effect of counterfeiting and piracy on the economy as a whole." Very interesting, very readable report. Recommended and probably essential reading for IP geeks. Kudos due to Loren Yager, Director of International Affairs and Trade at the GAO. I've just learned from one of our dedicated internal marketeers, who was checking on the academic advisors involved, that the Open University & BBC's co-produced series, The Virtual Revolution, has won a Digital Emmy Award for non fiction. There are lots of self congratulatory pats on the backs all round for the team that put the series together. Does the DEA have ISP get-out clauses? AAISP has an interesting analysis of the Digital Economy Act which suggests that the politicians and music industry lobbyists, currently walking around with smug grins about the passage of the Act through the parliamentary wash up process, will soon be complaining that ISPs are using 'legal technicalities' to "avoid their obligations" under the act. "Whilst the Act covers some other aspects such as Channel 4 television and some of the role of OFCOM, the relevant bits to us are the way it affects ISPs. The reasons for the Act in the first place are very questionable and are driven by the music and media industries. They are apparently claiming that they are losing millions to illegal file sharing and copying of their copyright material. They have apparently insisted something must be done and there is plenty of speculation about political party donations that may have driven the governments rail road approach to pushing this Act through. Just to prove a point, the BPI's own web site reports record sales of singles in 2009 so clearly file-sharing is not damaging the industry that much. The first problem is that the music industry is not losing millions. It is simply not logical. Yes, if many of the people downloading and sharing music paid for it then they would make millions, but that is clearly not going to happen. There are simply not millions lying around to give to the music industry. Even if there was, it simply means some other industry suddenly and unexpectedly loses out to the tune of millions and lots of jobs are lost - maybe in the fast food industry or clothing, or other entertainment industries. The Act can only serve to either stop people downloading music (rather than paying more) and possibly buy even less music as a result (because they are no longer in to music as much), or it will drive the file sharing to anonymous encrypted communications (already in use) which cannot be stopped. Before the Act the Copyright, Designs & Patents Act allows them to take civil cases against people. If the file sharing is driven underground they will not be able to trace people to do that, even. This is basically all of the definitions and leads to come interesting loopholes. The copyright owner can appoint an agent - fair enough. What is not clear is how an ISP knows the report they get is in fact from or on behalf of the real copyright holder. An internet access service is one that is provided to a subscriber - so if our customers are somehow not a subscriber then its not an internet access service they get. An internet access service includes allocation of IP address or addresses. So if we do not allocate addresses then it is not an internet access service. On top of this we have the fact that allocated is in fact a specific term in connection with IPs. IP addresses are allocated to a local internet registry, and then assigned to end users (not allocated). So using the definition in the industry none of our services are an internet access service anyway. An internet service provider is someone that provides internet access service, so if either of the above apply to all of our connections then we are not an internet service provider and most of the Act does not apply to us. A subscriber has to have an agreement with the provider of the service. So it is the person with the agreement that is the subscriber. If that agreement changes to someone else, the original person is no longer a subscriber even if they use the service." So if ISPs do not provide internet access services and customers are not subscribers then they are potentially both off the hook and the music industry has to go crying to government again about identifying "thieves" and "suspending" their internet access. Hee hee. Even if a judge did buy that argument, and even though one ISP has declared an intention to fight the DEA in court it is by no means a certain winner, it would likely only be a temporary victory. Such a decision would rapidly induce further lobbying and the subsequent inevitable tweaks to the law to close the loopholes. 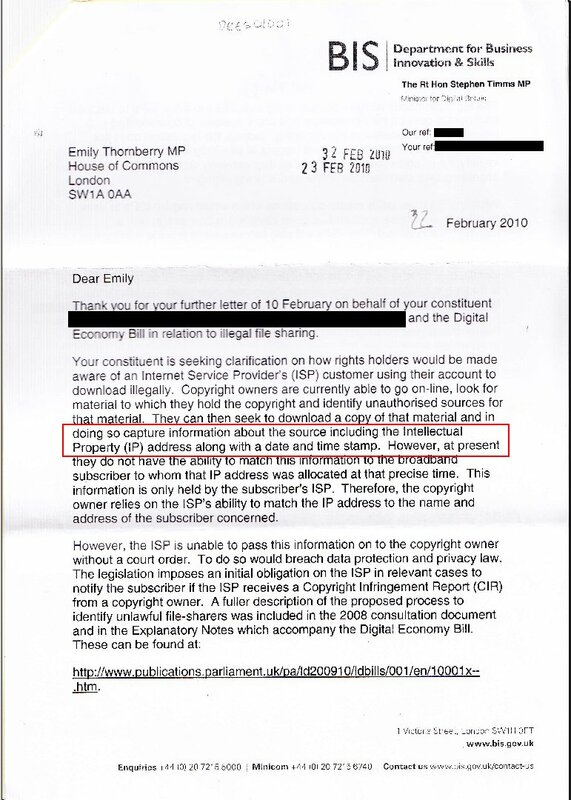 Mind you, what are the odds on a minister understanding the difference between assigning and allocating an IP address when he doesn't even know what an IP address is? The web blocking provisions define 'service provider' differently, as any person providing an infromation society service. This time the ISP, as a 'sevice provider', is on the hook, being required to block access to a "location" (website, webpage, newgroup, p2p services, warehouse, country?) from which a substantial amount of material has been, is being, or is likely to be obtained by, or made available in infringement of copyright. They also have to block any location that 'facilitates access to' such a location. So if you link or are suspected of linking expect to have your site blocked. The trouble is that the meaning of 'location' is unclear as it doesn't seem to be defined anywhere. And how many levels of separation are we talking about in relation to links here? Is a link to a site that links to the suspected dodgy site a 'facilitation of access to'? How about a link to a link to a site that links to the suspect 'location'? And where does this leave search engines and libraries whose business is access to information? I haven't had enough time on the detail of the final text to make a decent guess but it seems that the dangerous downloaders act is going to come back to bite its supporters and detractors. It really is important to subject these things to proper scrutiny even if only to make sure your 'service providers' responsible for throwing suspect 'subscribers' off the Net are indeed the ISPs who assign IP addresses to their customers. Craig Murray, the UK's former Ambassador to Uzbekistan (withdrawn in 2004 after exposing appalling human rights abuses in that country), believes that the UK electoral process doesn't stack up too well against that of the average banana republic. It's a damning analysis. "Against international standards, British elections leave a great deal to be desired. The first crucial failing is the lack of an independent administration of the elections. In each constituency, the election is not run by the Electoral Commission, but by the local authority. The national Electoral Commission has only an advisory role and cannot even monitor or instruct local returning officers. The returning officer is almost always the chief executive officer of the local authority. But there is a still more fundamental point, which raises doubts about the democratic validity of Britain's elections – and that is the question of whether a real choice is being presented to the voters. Now, we come to the most fundamentally undemocratic aspect of British elections: the electoral system. It delivers massively disproportionate results with minority parties virtually unrepresented in parliament. At the last election, it delivered a good majority to an unpopular Tony Blair, even though New Labour received only 36% of votes cast – which represented just 22% of those entitled to vote. But it does not favour the big parties evenly. New Labour can get a working majority with 34% of votes cast, while the Tories need 39%. If New Labour and the Tories both got 36%, New Labour would probably have almost 50 more seats. The Lib Dems could get 34%, yet win under half the seats that New Labour would get with the same percentage." Craig Murray was unhappy with the Guardian's treatment of his article and I hope he won't mind me reproducing a large chunk of it here. Most of what he writes about has been common knowledge amongst electoral system geeks for some time but he does summarise some of the key issues quite succinctly and the whole article is definitely worth a read. However, I must admit that the process of the Royal Mail becoming the official censors of election leaflets had completley passed me by. How the heck did I miss that one and was it just me or did it bypass the usual anti-liberty regulation detection networks too?